Today’s political landscape teems with critical topics; the economy, women’s rights and our diplomatic relations with China are but a few. These issues carry catch phrases and slogans that are disseminated to the general public via media and pop culture. We, the public, are inundated with instant clichés at every turn: television, magazines and sometimes even in literature and poetry. However, those of us that enjoy poetry expect subtlety, skill and guile because when it comes to poetry slogans and political banter simply will not do. 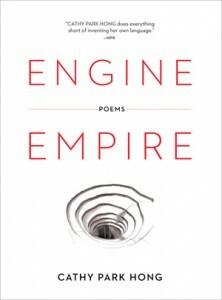 Enter Cathy Park Hong’s Engine Empire a collection that speaks volumes on “the issues” without declaiming from one single soapbox. Hong’s latest collection moves through the Civil War era, modern day China and the future as it conveys a startling idea: that human greed, ignorance and apathy are not necessarily resolved by technology but helped along by it. The aforementioned “Jim,” separated from his family during a raid, is the chapter’s silent protagonist, moving along the frontier with a band of brothers; a rag tag family of gold rush fevered low lives. lure him out with hen fruit and fresh violet marrow. We pounce him. Christen him Jim.